U.S. Senator Bernie Sanders easily gets constituents lathered about health care, education and the environment. 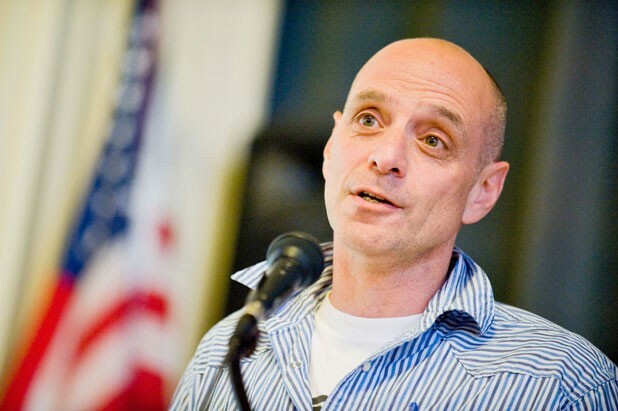 But last Saturday he met his match when he hosted a town meeting with Eric Schlosser, and the Fast Food Nation author got a near-capacity, crowded Burlington City Hall Auditorium really fired up about sustainable agriculture. Schlosser stressed the moral necessity of considering the folks who grow and process our foods and how they're treated and paid in addition to thinking about concepts such as "food miles" and pesticide usage. Referring to exploited tomato workers in Florida, Schlosser opined: "The fact is . . . If you eat these tomatoes, you're connected to . . . what's happening in Florida. There is enormous injustice going on." Wanna hear more about Schlosser's views on food ethics? Check back on July 9 for a Seven Days Q&A with the man himself.